Last night I saw the opening of Adam at the Angelika Film Center in New York. This movie gives a raw and amusing look into the peculiar life of a 29-year old man with Asperger’s syndrome who falls in love. Adam (Hugh Dancy) has never been outside of New York City. Both his parents are dead. He eats cereal for breakfast, goes to work, then comes home and eats dinner, to give you a sense of how he craves routine. When he meets his next-door neighbor Beth (Rose Bryne), sparks fly, but not in the way you’d expect. Because of his Asperger’s, Adam lacks the requisite social skills to recognize charm and other innuendo that usually accompanies flirting; a light touch on the arm, an extra-long glance, an opening to ask her out — all fall flat. Instead, Adam shows Beth his home-spun planetarium, set against the backdrop of his shower curtain. As he explains to Beth the mathematical distances between stars, we are able to understand Adam’s intelligence and love of reasoning, a common trait among those with Asperger’s, which is a form of autism. 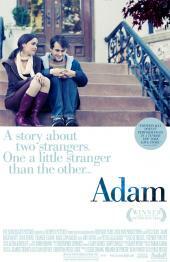 After a rocky start — “I get kind of overloaded,” Adam admits to Beth after a small outburst — the two begin a relationship. She reads up on Asperger’s, and is told that people with the developmental disorder don’t make good boyfriends. For his part, Adam suspends his routine to attend restaurants and parties with Beth. But he’s never comfortable, and Beth, a schoolteacher, is empathetic. That’s not to say their relationship is not real. It is intense, with many moments of tenderness. When Beth learns her father is in legal trouble and might go to jail, he stands before her, frozen. “I can see that you’re upset, but I don’t know what to do,” he says. So Beth begins to teach Adam about relationships and life, like comforting her when she’s upset, or having conversations with strangers. Adam doesn’t quite get it. At a party where Beth’s friend introduces her baby, the friend asks the couple if they’d like to see the video. “No, thank you,” is Adam’s reply. It’s a funny, provoking moment, making us realize how much we rely on our neuroses to make decisions. The rationally-thinking Adam knows better. Future dates are quiet. It’s winter in New York, and the falling snow is a reminder of how harsh the outside world can be for someone with a disability. When a job opportunity comes up, Adam is instantly familiar with the specter of discrimination against people with disabilities. Beth helps him prepare for the interview, teaching him how to do things many of us take for granted, like making eye contact. Eventually, Beth falls prey to her insecurities about love, trust and feeling needed — as we all do from time to time — and puts the relationship in a tizzy. As you root for the couple to pull through, you can’t escape the beauty of Adam having blossomed into just who he wanted to be. Playing the character of Adam wasn’t easy, Dancy says. “It was odd the first few days, and I struggled to make sense of things.” But he says he enjoyed watching Adam progress into a stronger man through his relationship with Beth, particularly when Adam revealed his condition to her. “He had to tell her, in order to stay in the game. He didn’t want to be alone in his apartment every night anymore,” Dancy says. Mayer, who recently showed the film to an Asperger’s association — it was very well-received — admitted knowing nothing about the condition when he started writing the script. “I read all I could, I spoke with many professionals and those with the condition,” he says. “I recognized early on that we don’t have all the answers,” he added, which he says allowed him a bit more freedom with the script. Adam opens nationwide August 28. I’d love to hear your comments.